Converts spreadsheets containing linguistic data to Standard Format (for use with Linguist’s Toolbox, Phonology Assistant, Lexique Pro, etc.). 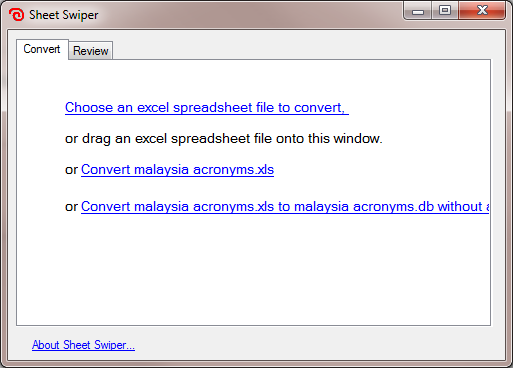 SheetSwiper converts spreadsheets containing linguistic data to Standard Format (for use with Linguist’s Toolbox, Phonology Assistant, Lexique Pro, etc.). The rules for how to do the conversion come from the first rows of the spreadsheet itself. Therefore subsequent, repeated conversions are easy for non-computer savvy users to do. Change any column headers in the first row of the spreadsheet to the standard format markers you want to use for the data in each column. Omit markers from columns you don’t want to use in the SFM. The first marker (usually in column A) will be used as the record marker. Save the file as XLS (not XLSX), and drag it onto the SheetSwiper window. By John Hatton, SIL International & SIL Papua New Guinea. The real work, the reading of the XLS, is done via code from Liu JunFeng’s Excel Fileformat Library project.